CUPS celebrated its 20th year anniversary in 2009 and had the opportunity to reflect on the many accomplishments of its mission workers over that extended period. This celebration included CUPS volunteers and many of the communities that had been served by CUPS over these 20 years. Much love and gratitude was shared by these communities for the many critical, health, education, health and community projects provided by the hard work and financial support from the whole CUPS family. After the celebration was over, CUPS turned its attention to dealing with some of the significant challenges facing it in these difficult times. One initiative involved redesign of the CUPS website to be more attractive and usable for you, our loyal supporters. This redesign has been accomplished using in-house resources, namely CUPS board members Steve Budde and Chris Friedersdorf. Additionally, CUPS decided to discontinue the mailing of newsletters and replace it with an electronic newsletter. This will save CUPS significant expenses, and hopefully allow our communications to be more timely and relevant. This change has required CUPS to develop a more robust set of email addresses, so that the maximum number of supporters can be reached. Louise, Laura, and the board members have worked diligently on this, and we are finally able to send our first "e-Newsletter" to help ensure that CUPS maintains effective communications with its support network. We hope that you find it informative and helpful, and that it gives you a good understanding of the work CUPS is doing. CUPS would appreciate your feed-back on both the website and the newsletter. Please let us know what you found effective or lacking, and offer any other comments that you wish. The CUPS leadership is committed to taking any steps that will help enhance the value and effectiveness of our communication tools. Please respond to the following email addresses with any comments: (to Louise) cups7456@cupsmission.org or (to John Moore, Board President) john.moore@stratusenergy.com. Will the current drug war violence currently being experienced in Mexico lead inexorably to the end of CUPS mission work? CUPS is an ecumenical ministry assisting northeastern Mexican communities to improve health and education, and fostering a sense of community while providing mission trip volunteers an opportunity to serve and be served. Working alongside community members, volunteers help build or enhance community facilities and foster related activities. Accomplishing this Mission Statement requires volunteers and financial support to address the health and education needs of northeastern Mexico. CUPS is currently facing considerable challenges to find the resources needed to meet these needs, even as these needs are expected to increase. CUPS has a 20 year track record of good service to the region. Included in many of CUPS' past projects have been improved water quality supplies to poor communities, health care facilities for those without access to health care, and enhanced educational facilities for children in needy areas. CUPS has established deep and trusted relationships with many community, education, and health leaders who look to CUPS for continuing support, and it is our goal to continue to help them as God gives us ability. CUPS is facing unprecedented financial challenges, and also the reality that reports of violence have deterred many volunteers from traveling to Mexico. The extent of these challenges is forcing CUPS to look for creative ways to finance its operations, to keep as many volunteers as possible involved in CUPS' work, and to continue to support the communities which count on us. One way CUPS is addressing the financial challenge is by reducing costs, including cuts to staff, office expense, warehouse expense, truck expense, and even postage and office supplies. Due to the very small number of workgroups this year, CUPS has reduced the number of projects, and has also recruited more volunteers than ever from the Mexican communities to assist with construction, while continuing to provide supplies and construction supervision. This approach will allow CUPS to complete two education projects - one for the Atizapan de Zaragoza Primaria, and the other for the Nueva Creacion Primaria in Valle Hermoso, While this is no mean accomplishment in the difficult environment of 2010, it is not a satisfying fulfillment of the Mission Statement. The CUPS directors are spending many hours evaluating ways for CUPS to turn this situation around in 2011, to provide the needed facilities, as well as opportunities for mission workers to be engaged. To what extent and how long the region will continue to experience the current unrest is unpredictable. One fact is evident - the ability for CUPS to serve the northeastern Mexican region in its traditional manner is very limited at this time. Recognizing this, and with a strong desire to remain a viable entity to serve the region, CUPS is pursuing the possibility of identifying some service projects on the US side of the border for 2011. In doing so, only projects that are consistent with CUPS' mission, ie. serving the health and education needs of communities, and providing excellent mission opportunities for volunteers, will be considered. An update on this initiative will be provided as more is learned this summer. If you, or your church, might be interested in this type of service opportunity on the US side of the border, we would very much like to hear from you. Even though CUPS is currently limited in its ability to assist communities in the northeastern Mexican region, CUPS staff continues to maintain its long-term relationships with health and educational institutions and hopes that we will be able to return to serving the needs of this region. The current state of unrest in the region has only made the needs more critical. CUPS asks for your continued prayers for our work, and welcomes any thoughts and suggestions on how CUPS can best address its current challenges. Also, we need your continued financial support now more than ever. Please go to the Quick Links for information on how you can provide financial assistance at this very critical time. Forest Hill United Church, Kitchener, Ontario, Canada presented a peace candle to the Peniel Presbyterian Church of Valle Hermoso, Tamaulipas, Mexico at their Wednesday evening praise service on March 19, 2010. Floyd and Edna Jenkins, members of Forest Hill UPC, and longtime CUPS volunteers, traveled to Valle Hermoso with Louise Flippin for the presentation. The peace candle was lovingly given and warmly received by the congregation. Edna wrote, "The service was very uplifting with their beautiful music, prayers and scripture. Pastor Armando Hernandez, his wife Martha, along with the congregation was most welcoming and was sincerely gratified for the timely presentation of the "Peace Candle". Peniel Presbyterian Church received Peace Candle from Canadian Church. Caring for our school friends. Donations from CUPS volunteers helped make the Day of the Child celebration in Mexico a special one for nearly 1300 children in kindergarten and primary schools. Resources for special activities at these schools are very limited or almost nonexistent, so the small toys, pencils, crayons and lots of other "fun" supplies the children received brighten their day and let them know that they are loved. President of Mano de Leon Primary school receives Day of the Child gifts. PET Rio Grande Valley - A new friend to CUPS communities in Mexico. CUPS and its volunteers have worked at many different special education schools in Matamoros and Valle Hermoso in recent years. We meet students with transportation needs and PET RG Valley has responded quickly in a loving way last spring. Sergio Rodriguez and Flor Garcia are the first two students to receive a PET. Sergio is 13 and lives in the rural community of Ensenada in NW Valle Hermoso. He attends school at the Ensenada Primary School where the kitchen and dining area, as well as the computer and library room, were remodeled last year by CUPS. 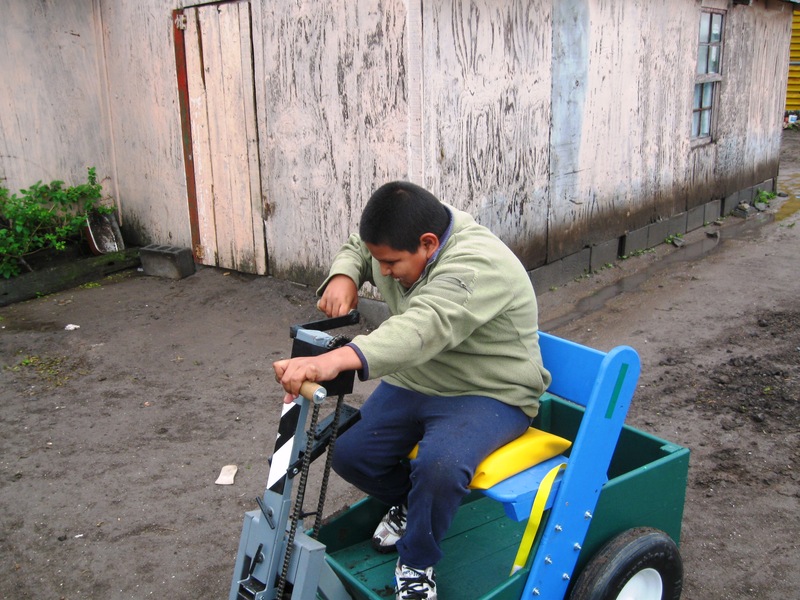 The transportation device - caritas as they are called in Mexico - provides independence and much needed upper body exercise. Flor is 13 years old, lives in a rural community east of Valle Hermoso, and attends middle school in Valle Hermoso. Flor says "My father is very happy because I am able to go with him to bring hay for our sheep. I am even able to bring some back on the back compartment, I love it, and I'm very happy." Sid Martin, PET San Antonio: "Thank you for helping us complete the circle. We can build PETs all day long but without folks like you, we aren't quite completing the circle. Please know that you and your ministry is in our prayers, and please know we are here in the future." The first day! Sergio learning to drive his PET. CUPS staff and local community volunteers at the Atizapan de Zaragoza primary school began work on the dormitory and kitchen dining area in mid-April. Dodging heavy rains at times, preparations to construct footings took place. Children greeted the arrival of the CUPS equipment trailer enthusiastically but were a bit disappointed to learn that no animals were in the trailer! The construction of a 16 x 40 ft. building will provide housing for two teachers and a healthy kitchen facility for the volunteer mothers who prepare daily meals for the students. This structure frees up space for the library and computer classroom. It was an absolutely wonderful week. We worked in the lovely rural community of Atizapan de Zaragosa.... They were so grateful that we came in spite of the news of problems in Mexico. Carol McCullough had provided kits for the children to make small bead crosses, which they loved!! In addition, she provided us with coloring sheets of Jesus and the lambs, with the story and Bible verse in Spanish, so we had a good VBS session. Another Presbyterian church had sent dozens of reading glasses, which we were able to dispense. The church which sent them didn't know where we were going, or the number of people in the community--yet we ended up exactly right. The miracle of the glasses (los lentes)! Atizapan primary school children wave to say thank you. Endings and beginnings Mexico still makes the news with violence between drug cartels or between the cartels and military forces. And yet... and yet, people in Mexico continue their daily lives with dignity, honor, faith. Studying...children in school... but not enough of them. Working....but not enough jobs for all who need to support family. Marching for peace....and this does empower those who march. I end with the words of two people, one who lives quite near McAllen in a small Mexican border city where much violence between drug cartels occurs; the other lives on the other side of the state of Texas near Juarez, perhaps the border city most in the news for its unceasing violence. this peace that passes all understanding. Change, Lord, the hearts of these people who have taken from us our peace, Lord, give to them needed peace. Juarenses are a tough lot, and many people are hunkering down and doing all they can to survive in and improve a place call they home. I am thinking of the residents of Villas de Salvarcar, scene of the gruesome youth massacre last January, who are organizing a new community library, kitchen and music center for children. I am thinking of the annual Christmas Posada for the children of Lomas de Poleo. I am thinking of the young people who stood on the streets on a recent day collecting for the Red Cross. I am thinking of the young actor with the "Love Juarez" t-shirt who told director Miguel Sabido he wanted his city back.